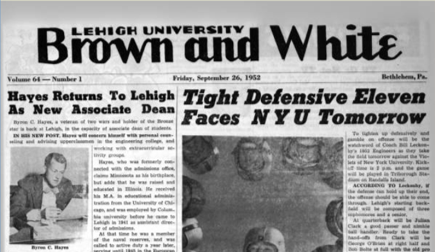 We have begun a survey of articles featuring Francis Quirk in the Lehigh University archives of the Brown and White, the student newspaper. While we have only been through a few years of his tenure, it has been an eye opening experience for three reasons. 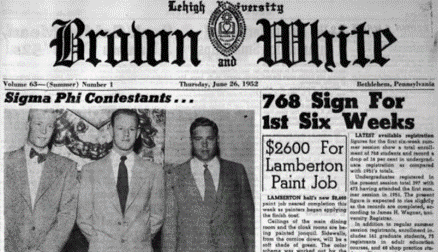 First, he established an active and vigorous exhibition schedule with eight events annually. We are working to establish a list of artisans involved. But it appears that Quirk had broad reach into the art community. Many of the artists that came through were very well-regarded with works in a number of area museums including the Woodmere Art Museum, the Michener Art Museum, Delaware Art Museum and the Philadelphia Museum of Art. He clearly was a pillar of the local art scene. He also enlisted these artists as guest faculty. Second, he extensively involved the community with the arts through exhibitions of faculty works, prized objects in faculty homes, and student works. He created a treasure of the week with a student work being hung in the Gallery in a place of high esteem. Several of these exhibitions were controversial, so there were forums for debate and discussion. Finally, he reached out to the community through television, a new medium at the time. As part of the Lehigh University Community he was active in many ways. One highly visible contribution was the redesign of the Brown and White newspaper banner in 1952.